Note: this post was originally written in July during my recent trip to Europe. 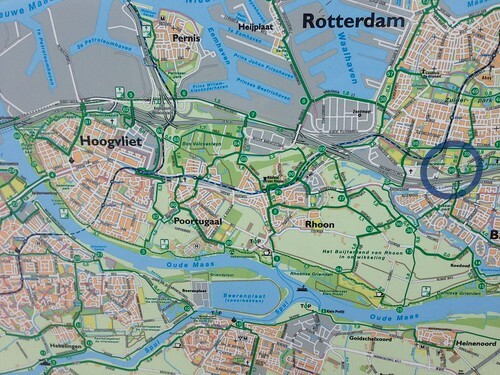 Every day on this trip, I try to find time to walk or cycle to a new part of Rotterdam. Last weekend I set out on another one of my trips which took me semi-accidentally to the beautiful town of Rhoon. Once again, the OBike bicycle-hiring service came to my rescue. It has been a great resource for me here in the Netherlands, although I am not sure that I would use it in Melbourne on account of the single gear. I planned my route using the intersection numbers on the famous fietsroutenetwerk (bicycle network). It works by numbering each intersection along designated bicycle routes. You work out your origin and destination, find the intersections numbers and write them down. Then you simply follow the signs at each intersection directing you to numbers. It’s a very cool system that makes wayfinding over medium and long distances much easier – and you don’t even need a map! 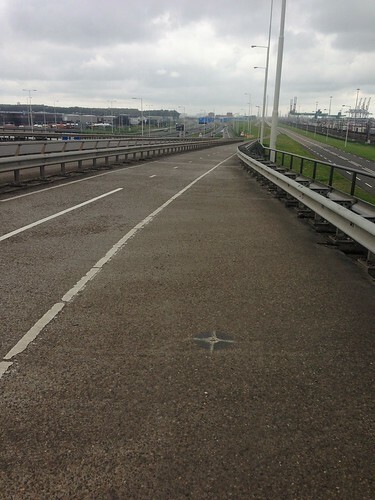 I set out across the Erasmus Bridge towards the port area. My route took me through some very interesting and varied urban form, from inner city housing to industrial port areas. After getting a little lost in the beautiful forests and parks of Pendrecht, I cut through to follow the railway line to Waalhaven; one of Rotterdam’s many port areas. Even here, the bike infrastructure did not deteriorate and was of high quality all the way through these non-residential sections. One interesting thing to note here was that half of a motorway on-ramp had been converted into a segregated bicycle path that ran between a railway line and the A15 motorway. To me, this was a powerful statement about the priorities placed on different transport modes. The transport authorities were willing to recognise the benefits of such a move and reallocated street space to bicycles. Imagine something like this being proposed in Melbourne – motorists would have a fit. Unfortunately, I picked the rainiest day of the week to travel. While riding alongside the A15, it started pouring with rain. This was a bad coincidence as this long grassy section had absolutely no shelter. I had no choice but to keep riding. My original plan was to continue all the way to Hoogvliet but I decided to cut my losses and not risk getting drenched again. I made a random turn down at the first opportunity to cross the motorway and head south. After getting help from a friendly local man (also on a bike), I found the winding road leading to Rhoon. 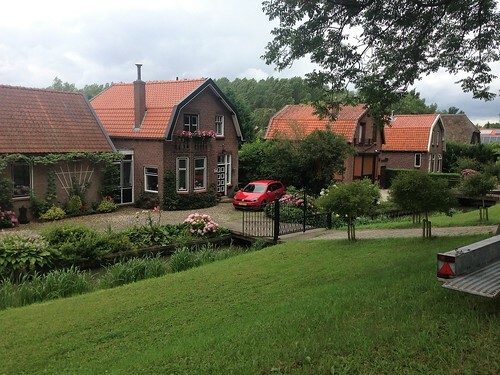 The best way to describe my impressions of Rhoon is to simply say that it is the picture-perfect place that I had pictured in my mind as the typical Western European country village. Having been established in 1199, it is unimaginably old by modern Australian standards. Every single building is perfectly proportioned and fits in nicely with its surroundings – even the more recent constructions. 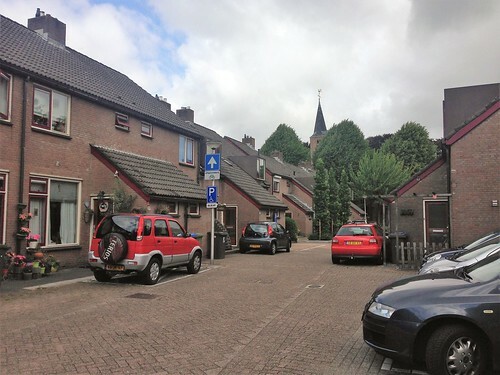 The central area is a little more compact but has the sort of narrow laneways that you often associate with such small village terrace houses. With the historic buildings, peaceful environment and cobbled surfaces you almost expect some 12th century farmer to come around the corner carrying carrots or potatoes. The Sint Willibrorduskerk Church is located near the centre of the village. It is surrounded by greenery and is very picturesque. A small memorial to the people from the Rhoon who died during the Second World War and subsequent Indonesian War of Independence entrance to the graveyard. I left my OBike at the Metro station (the only one for many kilometres around). As with every public transport stop that I have seen in the Netherlands, it was very well-designed. Entrances were located on both sides of the tracks, there was ample shelter and accurate real-time information was displayed in many areas. Even though it was a Sunday, trains were still operating to 20 minute frequencies in a town that isn’t even in Rotterdam. For an Australian, it is a little difficult to understand how Western Europe differentiates between the various modes of rail transport. 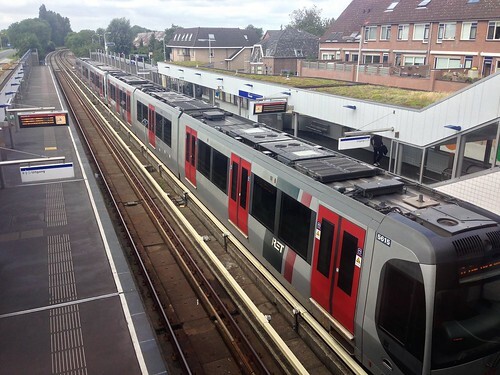 In the Netherlands, there are trams, heavy rail and Metro. To better conceptualise it, it is best to think of heavy rail as V/Line (intercity) and Metro as Melbourne’s suburban rail network (intracity). This is the case even though the vehicles used on the Metro here would probably be classified as light rail vehicles in Australia. As for the trip itself, the Metro was clean, punctual and convenient. It dropped me off right in the middle of Rotterdam and it only cost about €1:80. The screens and audio announcements made it easy to know where to get off the train. All up, a very pleasant experience. As with Melbourne, I highly recommend getting out of the city centre and visiting suburbs and outskirts of cities. It gives you a variety of urban forms and a taste of what living in the city is really like for the majority of the population. Plus, you can find hidden gems like Rhoon by accident!